In the first marathon to be held in 2013, starting at midnight, Astrid Mueller benefited from optimal weather conditions to beat her own course record by more than 15 minutes. Jan Fryc (CZE) achieved a start to finish victory in the men's race, although second-placed Christophe Scherno (FRA) started to reduce his 4-minute gap in the second half, but still finished 1:20 minutes behind. A total of 632 runners from 34 different countries participated in the various races between 6 km and 42.195 km. 226 of them ran the full marathon, a new record. Ethiopians doubled in the 11th edition with Negari Terfa setting a men's course record writes Mirko Jalava. The record was threatened from the start as 16 athletes passed through 10km in 30:01. Halfway passed uneventfully in 63:35, but by 25km it was down to 11 runners and at 31km Dickson Chumba made a short-lived break. 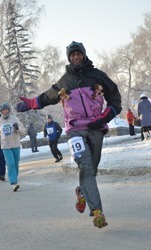 By 33km a lead group of seven had overtaken him and begun to speed up. Debutant Paul Lonyangat broke clear next with only Terfa following his move. Terfa's 2:07 personal best dated back to 2009. In five successive starts at Xiamen he had twice finished second. Lonyangat pegged him back but Terfa redoubled his effort after 40km and quickly gained a clear lead. He came home in a personal best and course record, also the third fastest time in China behind the top two 2008 Olympic finishers. The women's lead group was down to three after just 7km: Kenya's Eunice Jepkirui, fastest in the field with 2:21:41 and the Ethiopian duo of Fatuma Sado and Eyerusalem Kuma. Kuma was dropped after 16km, and Sado's only move came at 28km after which she quickly opening up a gap to finish more than two minutes ahead. Kan-Ho Chan, winner in 2011, went into the lead after 4km on this out-back course alongside the Plover Cove Reservoir and was never headed. 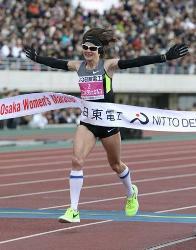 American Michelle Lowry defended her title as Kit-Ching Yiu kept pace to 11km and went on to record a personal best. The Championships, in their 20th edition, made great efforts towards inclusiveness and among the 3000 entrants were more than a dozen unsighted runners. One of them was Galant Ng, guided over the course by the sighted but deaf runner Michael Ng. 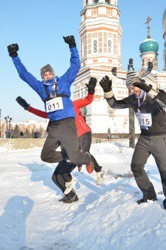 Over 350 runners, including 26 foreigners from 10 countries, braved a temperature of -26°C. 613 runners finished the Marathon and 1265 the Half. 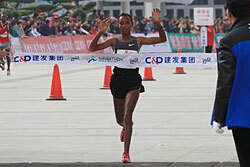 Pui Shan Chan won the women's Marathon for the fourth time. Running only her second marathon Valentine Kipketer salvaged Kenyan pride in otherwise Ethiopian dominated territory as she clocked a course record to win the women's race in the 10th anniversary edition writes Ram Murali Krishnan. Kipketer, just turned 20, ran a 2:28:02 debut in Hamburg but improved drastically on this tough course, under tough conditions — although this year's event was held in relatively cool weather. Her Ethiopian rivals kept pace to halfway but, after a brief showing by eventual runner-up Dinknesh Mekash, Kipketer went clear from 25km. On Marine Drive, with 5km to go, she was on her own but did not slow her tempo. In the men's race four runners debuted, and one of them came out on top. Eritrean Mulue Andom paced five runners for a good part of the race, setting up Ugandan Jackson Kiprop, Kenyans Laban Moiben, Elijah Kemboi and Jacob Cheshari and Ethiopian Abraham Girma. Kiprop, Girma and Moiben moved away on the hill at 35km, and descending it a kilometre later Kiprop edged ahead. 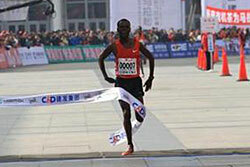 Cheshari, a debutant like Kiprop, charged back to the leader but was unable to keep pace over the final kilometres. Kiprop came home with a new course record and Indian all-comers' record of 2:09:32. Kiprop, a training partner of London Olympic winner Stephen Kiprotich, had paced the group in the earlier stages. Fauja Singh, who will turn 102 in April stepped up for the 4.3km senior citizens' race. More than 38,000 runners took part in this year's Mumbai Marathon in different categories which now includes a 2.5 km race for Champions with Disability. As usual pledges have been raised for charity and are expected to reach $3.4 million. Tatiana Gamera-Shmyrko came from behind to take longtime leader Kayoko Fukushi 900m from the finish writes Ken Nakamura. She inproved her personal best, set when finishing 5th in the London Olympic Marathon, by 24 seconds, but fell just short of a national record. Fukushi and third-placed Yuko Watanabe also set personal bests. A group of five, including the top three, Mari Ozaki and Yoko Shibui, passed through 5km in 17:09, 10km in 33:59 and halfway in 1:11:36. Pacing finished at 30km after which Fukushi was out on her own, well ahead of Gamera Shmyrko. But approaching 40km her lead started to diminish and she struggled for the last 2km as Gamera-Shmyrko took 43 seconds out of her in the final 2195m. Fukushi fell short of her 2:24 target which would have gained her automatic selection for the World Championships Marathon in Moscow.